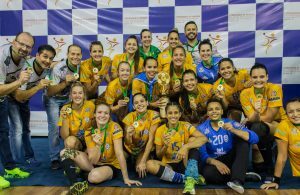 Home / News / IHF / Argentina beats Brazil, wins Pan-American games! Argentina beats Brazil, wins Pan-American games! Argentinians have triumphed yet again against their fiercest rivals at the Pan-American games. In a very tight match, the “Gauchos” beat Brazil with 22-21, despite the Brazilians having the last attack – they hadn’t had enough time to conclude their attack, and this saw Argentina winning the gold medal again, now their 3rd victory against Brazil in a row at major PanAmerican events. Chile won the third place with a 36-27 victory over Uruguay. ← Previous Story Tahirovic accepts HSV Hamburg offer, signs 1-year deal! Next Story → Gheorghe Tadici again Romania (W) coach!